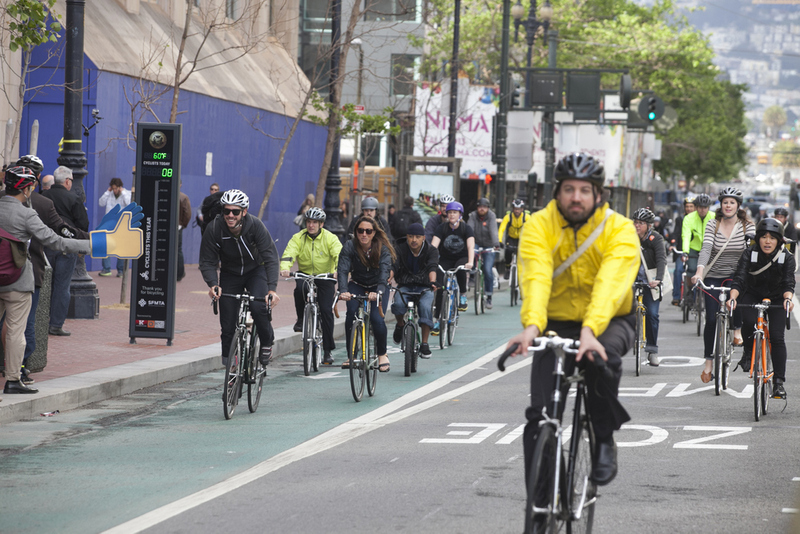 Elected officials and thousands of commuters took to two wheels for the 19th annual Bike to Work Day, welcomed by the new protected bike lane on Oak Street and the city’s first bicycle counter on Market Street. 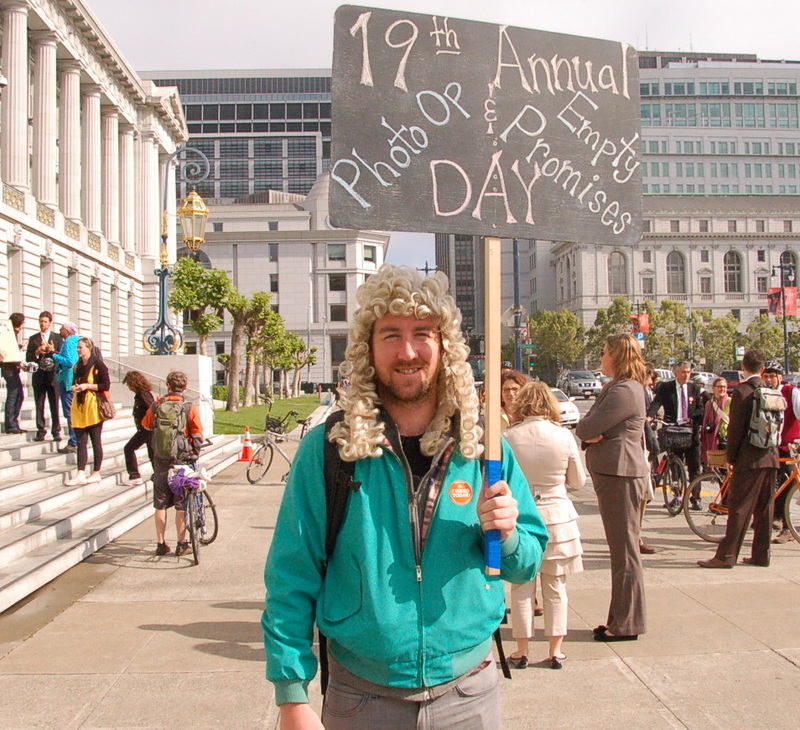 As in the past few years, the mayor and city supervisors gathered on the steps of City Hall to give speeches cheering bicycling, with some calling for the implementation of more bike lanes. The event saw record-breaking bike traffic counts, according to manual counts by the SF Municipal Transportation Agency, which found that bikes accounted for 76 percent of eastbound vehicle traffic on Market at Van Ness Avenue between 8:30 and 9:30 a.m. — a three percent increase in bike traffic over last year, and a nearly 30 percent increase since 2009. While city leaders had a few recent improvements to point to, important issues went unaddressed. 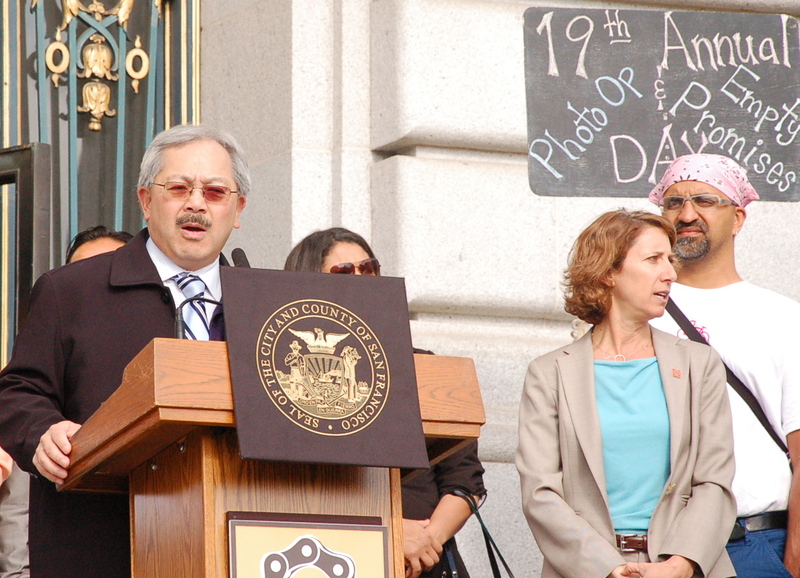 At the podium, Mayor Ed Lee made no mention of the SFMTA’s Bicycle Strategy, which he has so far refused to fund. Chiu, along with Supervisors Scott Wiener and David Campos — who represent San Francisco on the Metropolitan Transportation Commission — did call for an increase in the city’s abysmal level of investment in bicycling, currently 0.46 percent of the capital budget. 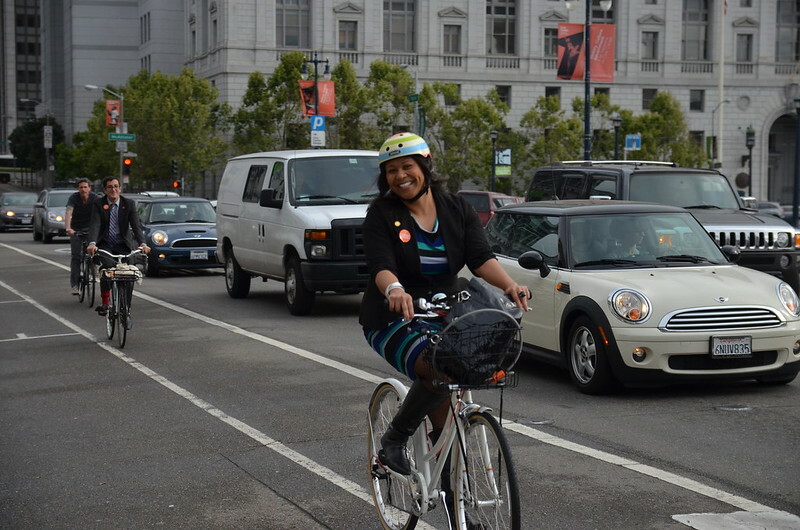 While Wiener has stood out as the Board of Supervisors’ most active advocate for increased funding for safer streets and faster transit, one of the city’s newest supervisors has emerged as a bicycling champion with her efforts to help get San Francisco’s latest protected bike lane on the ground — D5 Supervisor London Breed. 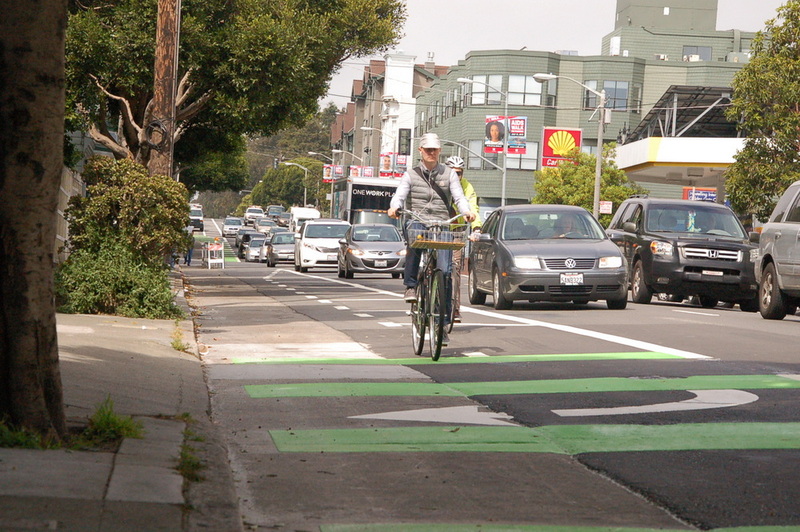 It was because of pressure from Breed that SFMTA planners found a way to get the essential components of the Oak Street bike lane on the ground in time for Bike to Work Day, according to Leah Shahum, executive director of the SF Bicycle Coalition. “We at the Bike Coalition had been working hard on that, but it really was her office’s extra pushing that got their attention and helped them quicken the pace,” she said. With Supervisors Breed, Eric Mar, and Mark Farrell pushing to procure a regional funding grant for a safety overhaul on Masonic Avenue, Shahum said City Hall’s support for the expansion of protected bicycle infrastructure still holds a lot of promise. “I think there’s real value in our supervisors riding in from their neighborhood, and not only experiencing it, but seeing so many people out riding,” she said. Perhaps no one is more skeptical of the politicians’ annual show of pro-bike rhetoric than Morgan Fitzgibbons, co-founder of the Wigg Party, a group that promotes sustainability in the neighborhood around the Wiggle bicycle route. Fitzgibbons stood behind the mayor during his speech, holding a sign that, on one side, read, “19th Annual Photo Op & Empty Promises Day.” On the other: “All Talk.” Fitzgibbons said he was asked by police to leave the steps of City Hall. Great article details, color, etc. I felt I was there listening to all that rhetoric interrupted only by trenchant protest signs. Feels like a scene from Animal Farm — the smarmy pigs are running things while the donkey with all his pathos is bridled up and carrying the load. I yelled out Polk Street twice during David Chiu’s talk. This is indeed an annual photo opportunity which supervisors can appear politically correct supporting the biking community. I rode in with my supervisor Farrell from district 2 with ten others – only one or two regular commuters were riding – the remainders were friends of Farrell. Many kudos to Morgan Fitzgibbons for his signage. Listening to David Chiu’s speech. Whatever. Mentions San Jose’s separated downtown bike lanes. Mentions that we need to do more for cycling in San Francisco. No mention of Polk. What a joke this has become. He is the one who choose to push cycling and make it his central issue. Now follow it up! Polk is our district, David. Logic and safety over emotion. Baloney. 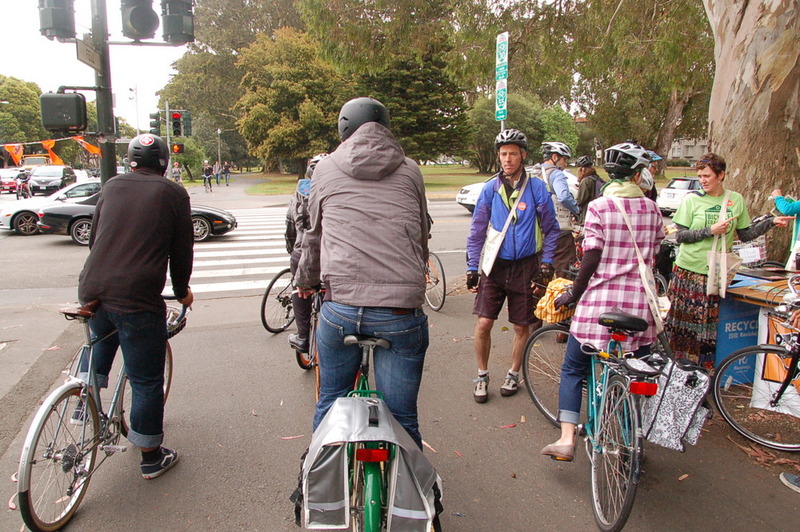 There is a schism between groups who favor more parking and groups who favor bike lanes. There aren’t any members of those groups changing their minds. More dialogue changes nothing except making people’s attitudes even worse. Chiu is the Supervisor. He has to make the call. Tough decisions are what being the man is all about. 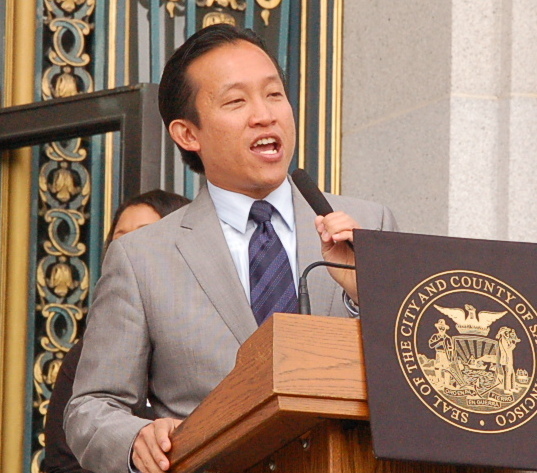 It’s easy to come up with a catchy “20% by 2020” phrase, Supervisor Chiu. The real work is in finding the needed funding and having the political courage to make a decision that improves safety in the face of noisy opposition. It’s a disgrace to set what is an unrealistic goal that gets people excited then do nearly nothing to try to achieve the goal. Thankfully some supervisors (like Breed and Wiener) come forward with action rather than just words. Wiener, I am impressed with. He is my rep and I am guessing is the next Mayor. Chiu, not so much. How was Wiener’s talk more impressive or more action and less talk than Chiu’s? Chiu has obviously completely embarrassed himself with Polk and made no one happy, but I missed the part where Wiener was pro-cycling with anything other than words. He’s into complete streets and transit, but what has he done to improve biking in the city. I remember that he and Avalos wrote letters urging Better Market Street to avoid delay, but that’s still just words and that’s the last thing I remember from him in regards to making bike riding safer as a form of every day transportation in the city. With fell and oak limping towards completion, I think the two most important projects right now are Polk street and car-free market today, Better Market Street tomorrow. It’d be nice if the supervisors or the mayor or both could push those to get completed as soon as possible. All the politicos speaking said the right (or near right) things. However, actions speak louder than words. Muni needs more money in a big way. Without proper maintenance, reliability plummets. Without reliability, no one can depend on Muni. The good news is this is something everyone can agree on! The bad news is no one seems able to come up with the funds whatever the consensus. What bicyclists really need is space. Generally taken from car parking or car travel, because that is what 90% of street space is currently devoted to. The good news is that in absolute dollars this is cheap! The bad news is that in terms of politics there will never be consensus. It will take courage and leadership to adapt our city to low-energy, low-pollution, space-efficient transportation methods. We will reach the 20% bikeshare by 2020 based on energy supply alone. Increased energy costs will continue to mean people leave the suburbs for more energy-efficient city living, which will continue to increase density in SF, which will continue to make private cars more and more inappropriate on our city streets. Declining world-wide (and US) oil supplies will render energy-gobbling private cars obsolete to all but the very wealthy. Declining natural gas, the highly climate-destructive properties of coal and the poor outlook for hydroelectric in the face of western drought means that even electricity will be hard to come by. Muni is subsidized 78% of each ride. I don’t see how SF will ever be able to come up with the funds to turn all car trips into Muni trips. Bicycling is the cheapest option; it also has the benefit of being quick, direct, practical, pollution-free and healthy. Really the only question is how much pain we give ourselves as a city on the path to get there. After the speeches, I went and observed the bike counter for a while. Two SFMTA guys were there watching it. It did okay picking up single riders, but had lots of trouble with clusters, which, given the light half a block before, bicyclists tended to arrive in. It also, of course, got none of the people riding down the adjacent (non-green) travel lane. I would say it missed at least 30% of the riders. I’m happy to hear about what an ally Supervisor Breed has been to safe bike riding in particular with her work to get funding for Masonic and pushing to get Oak finished. I wasn’t exactly expecting that when she won the election. Just imagine if every district office worked that hard on two critical bike projects, we’d have a nice network in no time. As far as I can tell, she’s the only supervisor who had something concrete (or green painted) to bring to BTWD. I agree about Supervisor Breed. I was wondering who had lit a fire under the SFMTA to get Oak done so quickly after so much inaction. Didn’t in the least expect it would be her. He was the impetus behind the Measure B bond. As he said to me – while he was riding a bike – “I am not a cyclist, but I am a big fan of keeping our streets paved properly for various reasons. The bike coaltion has been a big ally in that push, and riding a bike I really see why, there is a big difference between a well paved street and a poorly paved one”. Not to mention that every person who rides MUNI instead of driving is a benefit to every cyclist in town. Agreed. It is a very pleasant surprise to see Breed help actively orchestrate the sort of infrastructure improvements Chiu had once promised. Supervisor Breed has indeed been a strong advocate for projects like Fell/Oak and Masonic. I too am pleasantly surprised by her strong work on these matters. She’s done a good job surrounding herself with a good team of aides, and she appointed me to be the D5 representative for the Bicycle Advisory Committee – obviously a move I agree with. In addition to the advocacy of the SFBC and Sup. Breed, a key component in getting the Oak Street project on the ground that sometimes gets lost is the work of our organization the Wigg Party. As you can see, we are able to put the politicians in their proper place and not allow something like Bike to Work Day to function as a round of back-patting for a job poorly done. In my opinion, neighborhood groups like ours are essential for winning important improvements and helping to control the narrative as these projects unfold. The truth is, if we want to see the kind of success all across the city that we’ve had in the area around the Wiggle, people need to organize similar groups of local community members. Folks for Polk is making it happen in the midst of the process, but others should take the initiative now and get out in front so that we can make the changes that need to happen. It looks to me like Chu is using the bike community to get votes, but not actually following through on any tough action. If he won’t help with things like Polk St it means he will only support easy, non-controversial efforts. I think we all know we need more than that. We should swing our support behind people like Breed and Weiner, who while not has flashy a symbol are getting infrastructure built. That’s pretty vague. While measure B has been useful for a lot of projects like 8th and 17th repaving w/ better bike lanes, it’s still only baby steps. If he steps up and is instrumental in getting cars off of Market Street before Better Market Street starts or gets another similarly useful project implemented to improve biking in SF, then I’d see him as more of a leader. Until then he seems like more of an opportunistic ally that people are mapping their hopes onto, but I’ll be following him more closely this year especially in regards to the CEQA legislation. “The plight of our small businesses is very real”. So is the plight of those run over by cars due to insufficient safety measures. The thing is, the Polk Street commercial corridor stands to greatly benefit from these improvements. In trying to please everyone, Chiu is pleasing no one and he is killing his political career. Good. I have no patience for fake advocates. Get a backbone David. If David were reading that, he probably would not believe it. He’ll find out the hard way he’s wrong. I hope part of the city’s bicycle plan is to actually start holding bicyclists to safety standards, laws, and rules. Everyday I see and experience first hand how totally obnoxious and inconsiderate many of these bike folks can be. I asked someone at the Polk Street that I would happily campaign for a tax measure to pay for more SFPD officers to enforce traffic laws – and that I would hope they would contribute money to the campaign to raise their taxes. I never saw so many tongues tied so quickly. Way to go, missing Murph’s point there. Chiu has to listen to everyone involved because that is his job. The merchants have brought up their legitimate concerns about the plan to him and the SFMTA and so has the bike/ped safety advocates and other people involved in Polk Street. Now they are trying to find a plan that everyone can get something out of it. There is nothing wrong with consensus. Not everyone can have everything their way. Morgan nails it. David Chiu by trying to please everyone. Thing is, he knows better. He knows that a dedicated bike lane on Polk is necessary. He knows that it will be a boon to local businesses. He knows it’s a win all around, but lack leadership to speak up.